Aluminum is corrosion resistant and and virtually maintenance free. It has unbeatable strength to weight ratio when compared to other metals, and weighs in at roughly 1/3 as much as iron, steel, copper, or brass. Aluminum plate has heat conductivity better than any other common metal and conducts electricity comparable to copper products. Aluminum is non-toxic and can be used in food preparation equipment. It is non-combustible (does not burn) and has a reflective nature, making it suitable for light fixtures. Some end uses for all grades of aluminum include transportation, food packaging, furniture, electrical applications, building, construction, machinery and equipment. It is interesing to note that aluminum is the most abundant metal element in Earth's crust and makes up about 8% by weight. 2024 aluminum plate is the most widely used aerospace alloy. It has a high yield strength and good fatigue resistance, as well as good machinability and grain structure. 2024 aluminum plate is great for precision fittings and parts, including aircraft fittings, computer parts, and bolts. 3003 aluminum is the most widely used aluminum alloy. It has excellent workability and corrosion resistance, and reacts well to finishing such as laminating or anodizing. It is non-heat treatable. It is typically used for pressure vessels, garage doors, builder’s hardware, and more. 5052 aluminum is an alloy similar to 3003 aluminum, but with better corrosion resistance and strength. It is typically used for cooking utensils, mail boxes, railings, and more. 6061 aluminum plate is the most versatile and widely used of heat treat grades. It has excellent machinability, weldability and medium strength. (It is less strong when compared to aluminum 2024 and 7075). 6061 aluminum has great welding and brazing abilities due to its high corrosion resistance at all temperatures. Typical applications include pipe fittings and bridge components. 7075 aluminum is the highest strength aluminum plate that Alro stocks; it has a strength comparable to many steels. This aluminum grade has a relatively high cost, so it is typically used when cheaper alloys aren’t suitable. Typical applications include aircraft fittings, missile parts, bike frames, and more. 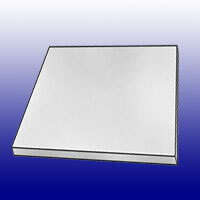 Alumold aluminum plate is a unique aluminum mold plate that has been successfully substituted for P-20 steel in a multitude of mold applications. It has better thermal conductivity, as well as dimensional stability and consistent through thickness hardness qualities. Alumold is most commonly used for thermoplastic injection molds for medium to large series. Cast Mold Plate is a cast aluminum mold product characterized by an excellent dimensional stability. It can be used to meet a wide range of mold making applications. Alro stocks both 2000 series cast mold plate and 5000 series cast mold plate. Alro stocks several different brands of Cast Aluminum Tool & Jig Plate. This material is produced from a fine-grain aluminum alloy which is free from internal stresses. It is typically used for assembly jigs and fixtures, rubber and plastic molds, prototypes, and more. Alro Steel is a top aluminum plate supplier with over 60 physical locations and ordering options for online metals. You can purchase aluminum plate by selecting the desired grade’s red button below. You can also visit one of our many retail outlets to purchase in person.